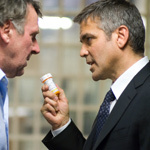 In Michael Clayton, George Clooney atones for the latest Danny Ocean movie and delivers a solid suspense flick. It’s not easy putting together a suspenseful drama that maintains a consistent sense of logic, plays with the audience, and carefully, strategically, reveals the true plot points as the story moves forward. Earlier this year, Fracture had a good thing going until it came to a ludicrous, forehead-smacking conclusion. Breach was better, but even with stranger-than-fiction facts on its side, it still wasn’t a fantastic movie. Now, finally, comes a smart drama that lets the audience second guess all it wants, throwing out a couple ruses and genuine leads along the way. As the titular Michael Clayton, Clooney marvelously brings to life a conflicted character. He’s spent the past 12 years working as a “fixer” for Kenner Bach & Ledeen, a corporate law firm. After all those years, Michael still hasn’t made it to partner, ostensibly being held back because he’s so good at what he does. While co-workers describe him as a miracle worker, he says he’s a janitor. He’s there to clean up other people’s messy mistakes. Even after spending his entire career working in the Big Apple in either fairly prestigious positions or well-regarded firms, at 45 Michael has nothing to show for his efforts, and he’s grappling with $75,000 in debt after a dabble in the restaurant business went south. It doesn’t help matters that he’s lost a chunk of change playing cards in seedy, smoky back rooms. The movie starts at one of those card games, when Michael’s called away to help a high-end client get out of a hit-and-run situation. The client is loaded, lives in an upstate mansion, has half a dozen cars in his garage, and he wants help placing the blame on fog, bad lighting, anything but his reckless driving. Well, all that’s for somebody else to tend to, and Michael the Janitor punts the guy over to a local attorney. On his way back home, Michael inexplicably takes a pit stop and wanders up a hillside to look at some horses. That’s a good thing; his car explodes in a vicious ball of fire while he stands mesmerized by the horses. From there, the movie backs up four days and, in explaining how things led up to the car bomb, Michael Clayton goes on to tell a story of mammoth corporate malpractice involving a $3 billion class-action lawsuit. It’s a sprawling case that’s been going on for six years and has racked up 85,000 documents in discovery. Things don’t get any better for United Northfield and Kenner Bach & Ledeen when their brilliant defense architect, Arthur Edens (Tom Wilkinson, Batman Begins) strips naked during a deposition and professes his undying love for one of the young plaintiffs. Arthur has obviously stopped taking his meds for manic depression. His frantic phone calls to Michael only further punctuate the point that the man has gone off the deep end. There is a stretch during Michael Clayton when things don’t seem to add up right, when it feels like it’s going to be a fairly humdrum affair. But writer/director Tony Gilroy knows what he’s doing with his story and it’s all part of his own master plan. While he’s written plenty (his credits include the Bourne series, The Devil’s Advocate, and... Oops... Armageddon), this is his directorial debut and it’s good enough to make Tony Gilroy a name to look for in the future. What makes Michael Clayton particularly fun to watch are its underlying themes. Yeah, ethics, integrity, concern for fellow man, all those things every major corporation boasts about while covering up their mistakes, play out right on the surface. So does greed. There’s a lot at stake for Kenner Bach & Ledeen, they’re in the midst of merger talks with a London firm and there are all those reputations at stake. Those reputations were built on tireless hours in the office and countless billable hours to the client. At one point, Karen Crowder (Tilda Swinton, Constantine), the general counsel for United Northfield, preps herself for a big interview and rehearses the “life balance” question. Her answer: Who needs balance when you enjoy what you do for a living? With that mentality, no doubt she’ll be the next bomb to go off. Even Michael’s son (yeah, the guy’s got a son and he’s divorced, he also has an alcoholic brother on top of all his other personal disappointments) offers some insights on the nastiness of the real world as he keeps nagging his dad to read a fantasy book called Realm + Conquest. Nobody has any alliances, he explains. Everybody fends for their own interests. Yeah, son. Dad can relate to that just fine, it’s hardly fantasy material for the senior Clayton. He lives it every day. But there’s another theme that seeps in with Arthur’s off-kilter behavior and it seems to work into Michael’s psyche: in this day and age, you have to be a little crazy to be honest and to take a stand. At the very least, it’s likely you’ll look crazy to other people when you do. While Michael Clayton doesn’t necessarily offer anything particularly new to the genre, it’s still a good, old-fashioned underdog story with a flawed, duplicitous, yet sympathetic lead character who winds up being a person worth cheering for.